Dr. Budd has worked at Heard Island from 1954 to 2012, and has published a history of the island’s exploration since its discovery in 1853. His contributions have been recognised by the naming for him of three topographic features on the island  Budd Peak, Budd Pass, and Budd Ridge. 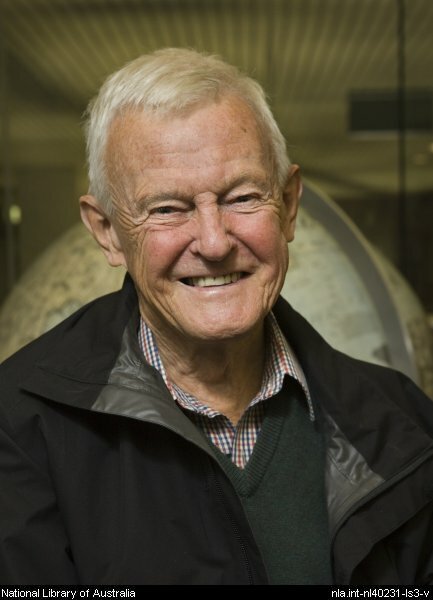 Grahame Budd was Associate Professor of Environmental Health in the University of Sydney from 1979 until his retirement in 1996, and is currently an Honorary Associate Professor in the same university. He wintered at Heard Island in 1954 as medical officer and expedition leader, and at Mawson in 1959 as medical officer and deputy leader. He subsequently revisited the Antarctic on six summer expeditions and four tourist cruises, and has worked as the sole doctor with isolated groups in the Karakoram, the Himalaya, and New Guinea. With Eric Shipton and six companions he spent three months in the Karakoram in 1957, climbing and surveying to fill in one of the last ‘blanks on the map’. As a member of Australian, American, and French Antarctic expeditions he made a ten-week traverse on the Antarctic Plateau in Adelie Land, and numerous journeys at Mawson, Heard Island, and Kerguelen. As a member of the first private Australian expedition to the Antarctic since Sir Douglas Mawson’s in 1929, he and his crewmates sailed the 19 m schooner Patanela, skippered by Shipton’s climbing and exploring partner Bill Tilman, to Heard Island, where they made the first ascent of Big Ben (9,000 feet) and completed a scientific program. At Mawson in 1959 he made dog-sledge journeys of 80-320 km in midwinter and spring to study three colonies of emperor penguins, and also to measure his party’s responses to cold. During five expeditions to Heard Island between 1954 and 1971 he made two complete and three partial overland circuits of the island, documenting the glacier fluctuations, and the island’s colonisation by king penguins and fur seals, that seem to have been caused by climate change. He also made the first known landing on the nearby McDonald Islands, and published the first detailed description of them. In 1963 he and two companions barely survived an unsuccessful attempt to make the first ascent of Big Ben and to investigate its geology and glaciology. They succeeded two years later, after their ten-week voyage in Patanela and repeated capsizes in the island’s freezing surf. Research undertakings in other parts of the world have included a year in remote parts of New Guinea, three summers on the fireline of Australian bushfires, and numerous industrial consultancies and research projects in hot and cold workplaces and in the laboratory. Grahame Budd is a Fellow of the Royal Australasian College of Physicians, holds the Queen’s Polar Medal, and is a Member of the Order of Australia. His published work mainly concerns human responses to heat and cold; the population ecology of emperor penguins, king penguins, and antarctic fur seals; the fluctuations of Heard Island glaciers; and the history of Heard Island. G M Budd (2013), Untamed southern isle. Australian Geographic 114: 86-98. G M Budd (2010), Australia’s Antarctic Heritage at Heard Island. In Gretchen Poiner (ed) The National Estate  Cultural Heritage. 2009 Conference Proceedings, Independent Scholars Association of Australia Inc: 157-171. G M Budd (2007), Australian exploration of Heard Island, 1947-1971. Polar Record 43 (225): 97-123. G M Budd (2000), Changes in Heard Island glaciers, king penguins and fur seals since 1947. In M R Banks and M J Brown (eds), Heard Island Papers. Papers and Proceedings of the Royal Society of Tasmania 133(2): 47-60. G M Budd (1964), The ANARE 1963 Expedition to Heard Island. ANARE Report No. 74. Antarctic Division, Department of External Affairs, Melbourne, 53 pp. Available from Australian Antarctic Division, 203 Channel Highway, Kingston 7050, Tasmania, Australia.